When the Überjam crew gets together, you should always be prepared for something completely different. The John Scofield-led group is 21st century jazz opened up for all to enjoy, combining virtuosic guitar work and live instrumentals with chaotic electronic samples and loops, all jammed overtop a subtly complex musical form. It’s a bridge into the world of jazz for the current generation of would-be listeners who aren’t prepared to dive headlong into the exisiting canon. Scofield made that claim during a recent interview over the phone from his New York home. Immediately after, though, the guitar legend — who has shared the stage with Pat Metheny, Miles Davis, Bill Frisell, and Jaco Pastorius, among many other enormously influential musicians — seemed a bit taken aback by his own appraisal of the state of jazz. Überjam came together eleven years ago. In the early Nineties, Scofield’s style began to stray towards a funkier, “jazz rock” vibe, and in 2002 he was on the lookout for like-minded musicians to cut loose with. Enter Avi Bortnick and Adam Deitch, rhythm guitarist and drummer, who helped Scofield explore a drum and bass, groove-anchored fusion of jazz, funk, and rock. Groove reigns above all for the überjammers. Their live performances and their studio albums focus on longer tracks, and the steady buildup and repetition or ideas through hills and valleys of dense sound and lots of space. Scofield flows his lead guitar, cleanly or modulated with pedals and synths, over the funky rhythm guitar of Avi Bortnick. For good measure, some tunes drop in hits from the organ or the occasional horn, but all share the ubiquitous pace-setting drum and bass combo. The band meshes together in a undeniably jammy way. Their music isn’t overly challenging or face-meltingly complex, but that’s kind of the idea. The first self-titled Überjam album was released in Janurary 2002 and was followed up by 2003’s Up All Night. Scofield has been consistently recording and touring with other acts since then, but it’s been a decade since her rounded up his Überjam family and hit the road. Fans of the group from ten years ago will be right at home during their June 23 Jazz Festival performance (or listening their May 2013 album Überjam Deux), but shouldn’t be surprised if they hear a more developed sound from a group of musicians who have notched another ten years of experience into their guitar straps. Scofield has been conscious of the way his style has evolved over the years. He says that even though his voice on his instrument is constantly moving forward, he always stays well within reach of his jazz roots. Even so, tracking these changes can be a surreal experience. The lifelong musician occasionally — although not often — finds himself listening back to recordings of his own music from the 70s and 80s. “I know I’ve evolved and got better on the instrument, gotten more comfortable with music, and have more direction,” said Scofield. “I was kind of amazed. I thought ‘oh, in 1979 I could hardly play,’ but that still sounds like me.” And in typical 2013 fashion, it’s not just looking back on his own older recordings that keeps Scofield on his toes. Nowadays he has the Internet to thank for that. Like many of the most successful musicians touring and recording today, especially in the world of jazz, Scofield has carved out his own unique sound. Überjam serves as a creative outlet for the kind of music that he has fun exploring; a place to channel his funkier, modern, instrumental soul, without being locked into to a more rigid specific genre or feel. You can get a feel for his style yourself next weekend right in Saskatoon. 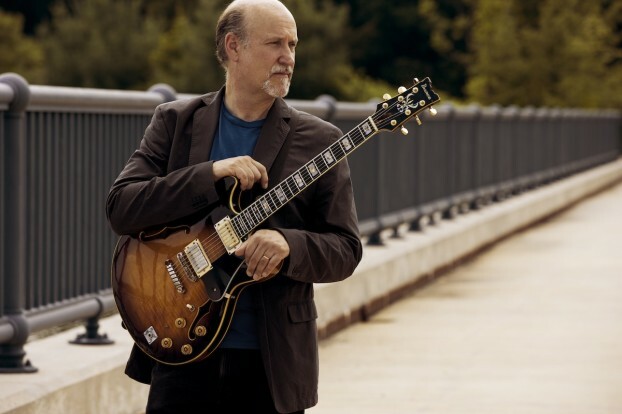 John Scofield and his Überjam band will be playing at the Saskatchewan Jazz Festival on June 23 at the Broadway Theatre.